College Korean offers a comprehensive introduction to the Korean language designed for American students. Rogers, You, and Richards have used their many years of teaching to devise and test an approach that balances reading and writing with the spoken language. The result is a well-rounded textbook suited to a yearlong course in which students learn to conduct conversations about their own lives and interests, read texts written in hangul, and write simple compositions. The book systematically introduces basic Korean grammar, a contextualized vocabulary, and styles of speech that are sociolinguistically appropriate for college students. Each of its 26 lessons contains a dialogue or a reading, practice patterns, relevant grammar notes, and exercises. Approximately 150 Sino-Korean characters are also introduced, and complete glossaries and grammar indexes are provided. The 20 chapters in this book provide a wide range of practical, everyday situations to help readers improve their written Korean, Hangeul. Every chapter has specific goals, tasks, sample texts, vocabulary & expressions, grammar, and culture tips. Plus, with an answer key at the back of the book, readers can carry out a self-assessment at the end of each chapter. This is a guide to Korean language usage for students who have already acquired the basics of the language. Unlike a conventional grammar, it highlights those areas of vocabulary and grammar which cause the most difficulty to English speakers. 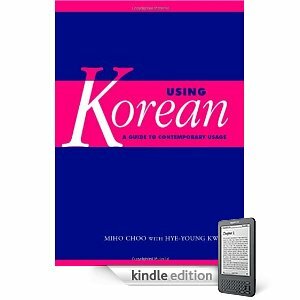 Clear, readable and easy to consult, it is essential for all those who wish to take their Korean beyond the beginner's level. This workbook accompanies the thoroughly revised edition of Integrated Korean: Beginning 1, the first volume of the best-selling series developed collaboratively by leading classroom teachers and linguists of Korean. All series’ volumes have been developed in accordance with performance-based principles and methodology—contextualization, learner-centeredness, use of authentic materials, usage-orientedness, balance between skill getting and skill using, and integration of speaking, listening, reading, writing, and culture. Grammar points are systematically introduced in simple but adequate explanations and abundant examples and exercises. Each situation/topic-based lesson of the main texts consists of model dialogues, narration, new words and expressions, vocabulary notes, culture, grammar, usage, and English translation of dialogues. In response to comments from hundreds of students and instructors of the first edition, this new edition features a more attractive two-color design with all new photos and drawings and an additional lesson and vocabulary exercises. Lessons are now organized into two main sections, each containing a conversational text (with its own vocabulary list) and a reading passage. The accompanying workbook, newly written, provides students with extensive skill-using activities based on the skills learned in the main text. This is a thoroughly revised edition of "Integrated Korean: Beginning 1", the first volume of the best-selling series developed collaboratively by leading classroom teachers and linguists of Korean. All series' volumes have been developed in accordance with performance-based principles and methodology - contextualization, learner-centeredness, use of authentic materials, usage-orientedness, balance between skill getting and skill using, and integration of speaking, listening, reading, writing, and culture. Grammar points are systematically introduced in simple but adequate explanations and abundant examples and exercises. Each situation/topic-based lesson of the main texts consists of model dialogues, narration, new words and expressions, vocabulary notes, culture, grammar, usage, and English translation of dialogues. In response to comments from hundreds of students and instructors of the first edition, this new edition features a more attractive two-color design with all new photos and drawings and an additional lesson and vocabulary exercises. Lessons are now organized into two main sections, each containing a conversational text (with its own vocabulary list) and a reading passage. The accompanying workbook, newly written, provides students with extensive skill-using activities based on the skills learned in the main text. "Integrated Korean" is a project of the Korean Language Education and Research Center (KLEAR) with the support of the Korea Foundation. In addition to the five-level Integrated Korean textbooks and workbooks, volumes include "Korean Composition", "Korean Language in Culture and Society", "Korean Reader for Chinese Characters", "Reading in Modern Korean Literature", and "Selected Readings in Korean". See it. Hear it. Speak it. Put 1,400 Korean phrases in your pocket, and enjoy your travel experience without getting lost in translation. 1. Go to "Artist"--Choose the theme you want. . 2. Go to "Album"--Select your topic within the theme. 3. Select the phrase you want to hear--You will hear the phrase and see it on your iPod screen! . . Missed it? Just click and repeat the track as many times as you need! Or create your own playlist to keep favorite phrases handy. With iSpeak, you're in control! For use on your: iPod, iPod nano, iPhone, Zune Screen images will vary among iPod models. . Contains one MP3 audio disc and 16-page booklet. . Requires 300MB of free space. . iPod is a trademark of Apple, Inc., registered in the United States and other countries. . Zune is a registered trademark of Microsoft Corporation, Inc., in the United States and other countries. This book provides a practical approach to learning an essential part of the Korean language. The 500 most important Korean adjectives have been identified and presented in alphabetical order. For each vocabulary item, you can see its pronunciation, Romanization, meaning, and the model word for which it follows the same conjugation rules. There is also the adjective s table of conjugation, some familiar related words, common sentence patterns and some sample sentences. An mp3 CD is also included. This book is a helpful guide to learning Korean adjectives as well as a handy reference tool. You will also find the book 500 Basic Korean Verbs helpful as well. This two-volume textbook series aims at fostering young learners skill of listening to and speaking Korean through various stimulating activities as well as learning relevant aspects of Korean culture. The book has been set up in a fun and enjoyable way as every section comes complete with activities, songs and games for students to play, as well as pictures that help explain the lesson. The accompanying audio CD helps students acquire accurate pronunciation of Korean words. "Intermediate Korean: A Grammar and Workbook" comprises an accessible reference grammar and related exercises in a single volume. This workbook presents twenty-four individual grammar points, covering the core material which students would expect to encounter in their second year of learning Korean. Grammar points are followed by examples and exercises which allow students to reinforce and consolidate their learning. "Intermediate Korean" is suitable for both class use as well as independent study. Key features include: clear, accessible format; many useful language examples; all Korean entries presented in Hangul with English translations; jargon-free explanations of grammar; abundant exercises with full answer; and, key subject index. Clearly presented and user-friendly, "Intermediate Korean" provides readers with the essential tools to express themselves in a wide variety of situations, making it an ideal grammar reference and practice resource for students with some knowledge of the language. Andrew Sangpil Byon is Associate Professor at the State University of New York at Albany, where he teaches courses in Korean language and civilization.